We have the finest wine selection and will ensure you have the best customer experience in the area. Cork Wines & Spirits opened in Hoboken July 2014 and in Harrison December 2014. Both cities were in need of a fine wine shop to meet the palates of an amazing and knowledgeable crowd of wine enthusiasts. Not only do they love a delicious wine, but are willing to explore the vast ways that people extract this liquid from grapes. We have taken it upon ourselves to find winemakers who are interested in bringing their creations to New Jersey. The Wine Guys taste every wine that is in our stores, handpicking each item, making sure that our customers receive only the best. In addition, we encourage our customers to participate in our tasting panels adding their selections to our offering! 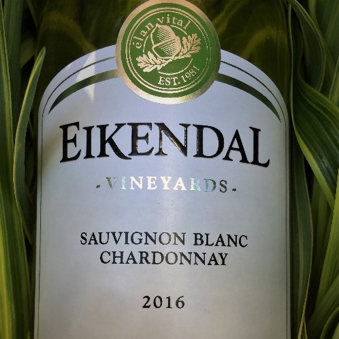 At Eikendal their focus is all about preserving flavor, through their collaboration with mother nature and dedicated had work to maintain freshness, elegance and finesse expressed in wines that appeal to palates worldwide. This fresh summer sipper is just that and a great value at $11.99. Grapes from individual blocks are picked from vineyards grown in Stellenbosch and Elgin, specifically to create the style of this white blend, made from 72%.Sauvignon Blanc and 28% Chardonnay. From harvest to bottling the focus is to make a wine that’s clean and crisp. This vintage shows the Sauvignon Blancs beautiful ripe tropical flavors of gooseberry and figs with peach and apricot. The Chardonnay creates the backbone and structure while adding and subtle notes of apple. The finish of this wine is crisp and tight with a touch of minerality that lingers. Serve this wine as a pleasant aperitif or pack a bottle in your picnic basket to enjoy with some mediterranean fair. Preheat the oven to 450 degrees F. Oil a medium-sized baking dish with high smoke point oil (I use grape seed oil). Place the chicken breasts in the dish. Using a spoon, scoop the 1/2 cup hummus into a measuring cup to avoid contaminating the rest of the hummus from the raw chicken. Put the remaining hummus away, and spoon hummus from the measuring cup on the chicken. Spread it around until the breasts are evenly coated. Sprinkle the minced garlic, smoked paprika, cumin, and red chili powder on top of the chicken (or whatever seasonings you choose to use). Squeeze one lemon half over each chicken breast.